The deep cold and heavy snowfalls of this winter snuggled my husband and I underneath hand stitched quilts with pots of coffee and hot chocolate nearby. Watching the snowflakes drift endlessly downward captivated us and our cat, Spike. A perfect setting for listening to cassettes of Louis L’Amour novels. A “frontier novelist”, L’Amour wrote from deeply immersive research as well as personal experience in his westerns brimming with the frost and dust of the rugged West. He had traveled extensively and dabbled in life as a sawyer, miner, hobo, prizefighter, merchant seaman and soldier. The insights he gained are reflected in the Western fiction based on storytelling of history. L’Amour wrote for the brand about cowpunchers who “ rode for the brand”. In the preface to his short story, “Riding for The Brand”, L’Amour explains that this is a term that a cowboy uses as a commitment of loyalty to an employer. The brand was the imprint that the ranch designed and burned onto the hide of each head of cattle that the rancher owned. 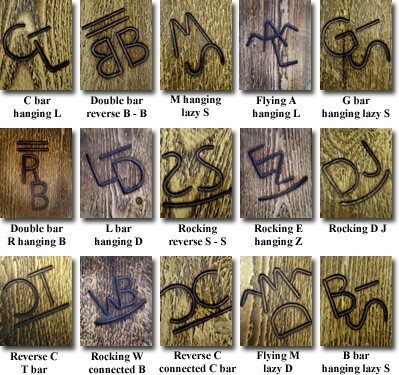 The names of the ranches were descriptive of their symbol: the Flying M, Double D, Lazy K. In modern times, freeze branding has displaced hot-iron branding as the preferred method of identifying a herd of cattle for its owner. Freeze branding elicits a milder pain response and can minimize hide damage, making a more humane alternative to the icon Western image of branding. The brands that ranchers use are registered like trademarks and are monitored, taxed, and regulated. They serve as a means to combat theft and fraud. Changing the brand, as a cattle rustler may do, leads to serious consequences. Branding is still the preferred preventive measure to combat cattle thieves. These deeply personal symbols identify an entire family and document their history in the region. This highly personal mark is serious business. 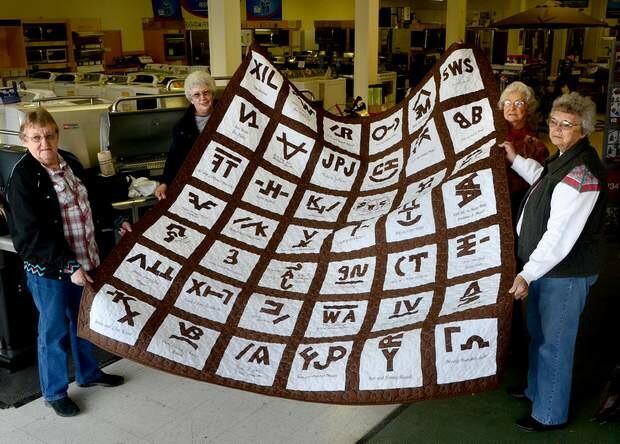 Over the years, quilters in the West have been intrigued with the designs of this secret language of brands. 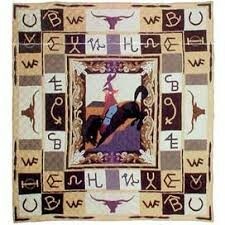 Some ranch wives, calling themselves “Cowbelles”, have stitched masterpieces that identify the ranch brands in their area. The accumulation of these quilts record the addition and retiring of brands over the decades. Some of the quilts date back to the 1930’s. History in fabric and stitches. The 2015 Cowbelles quilt featuring local ranch brands. Photo courtesy of Paula Neal. brand quilting, cattle brands, Cowbelle Quilters, Louis L’Amour. Bookmark. WOW!!! I never even dreamed of this kind of quilt but it makes sense when you think about it… and it would hold history as well as pride… love it!! Loved the idea of the quilt! 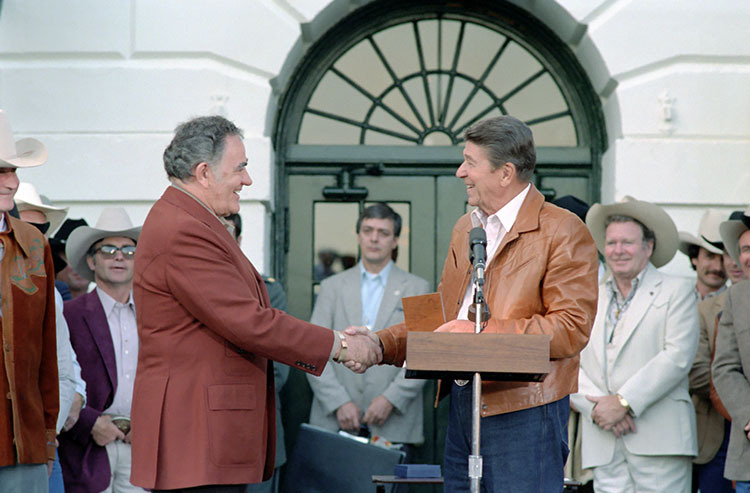 Louis L’Amour, a treasure.